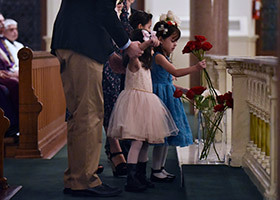 FORT WORTH — The dignified yet somber procession of parents and their children approaching the altar with 60 red and white roses from the back of St. Patrick Cathedral served as stark reminder of the estimated 60 million unborn babies lost to abortion since the U.S. Supreme Court’s Roe vs. Wade decision of Jan. 22, 1973. 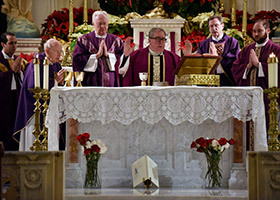 They and others celebrated the diocese’s annual Respect Life Mass on Jan. 21. Participants afterward said the Mass inspired optimism given recent political and cultural developments but, for the same reasons, said they remain pragmatic about the challenging work still to be done. Several said recent appointments to the Supreme and federal courts, for example, bring hope that an end to legalized abortion may be in sight. On the other hand, they stressed that cultural norms harbored by many and the enactment of New York state legislation vastly broadening access to abortion make clear the battle for hearts and minds is far from over. During his homily, Bishop Michael Olson discussed St. Agnes of Rome, whose feast day falls on Jan. 21. Bishop Olson held in sharp relief the example of St. Agnes’ life against the court’s ruling 46 years ago. The decision in large part, he said, provoked a “gradual erosion of attitudes” toward our country’s relationships to God, family life, and the sanctity of life. 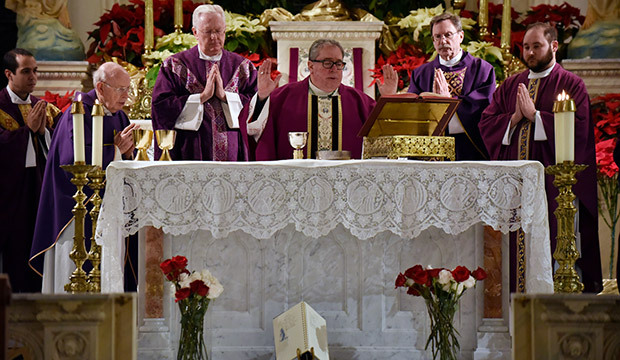 The Mass, Bishop Olson said, was a call for God’s help both for the voiceless victims of abortion and to seek encouragement for the faithful to remain resolute in their efforts to celebrate life as precious from conception to natural death. Whether developments in the federal court system and some state legislatures bring positive change remains to be seen, he said. Terri Schauf, diocesan Respect for Life coordinator, said the situation in some ways appears more promising than in years past. Recent University of North Texas graduate Cody Barker tempered hope of change with realism. UNT student Mary Brockenbush, who also attended the Mass, admitted that at times it feels like an end to legalized abortion is a long way off. “But that doesn’t mean we’re going to stop praying and stop hoping,” Brockenbush said. Another challenge, Schauf said, is that 46 years of legalized abortion has jaded many to the finality of abortion. Schauf said it heartened her to see the former and current UNT students and other young Catholics at the Mass. Most Blessed Sacrament parishioner Bernadette Gutierrez agreed. She joined her husband and four children in presenting roses at the altar during the Mass. 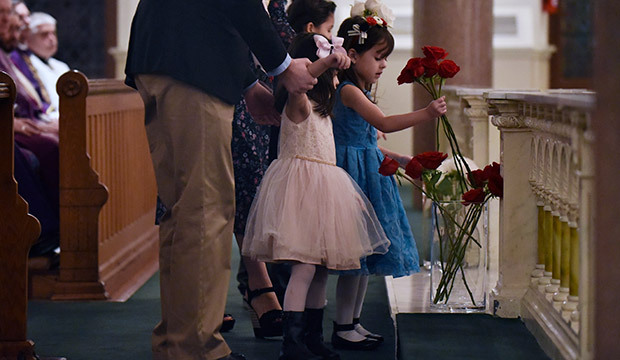 St. Bartholomew Parish Director of Formation and Evangelization Joel de Loera, his wife, and five children also participated in the presentation of roses. “My wife and I are firm believers in this,” Joel de Loera said of the fight to end abortion. “We want to instill that in our children, that life is precious from the moment of conception to natural death. Bishop Olson said he prays for the day when political and cultural changes render the Respect Life Mass unnecessary.